It seems odd to talk about "One Planet Living" given that we have only one earth--and that no other celestial body in the universe is known to support life. Of course, when there is information to show that humanity is living beyond its means--beyond the earth's capacity to feed and clothe us--the discussion takes on new meaning. According to Dr. Mathis Wackernagel of the Global Footprint Network humanity already needs 1.2 planets to keep up with our consumption of natural biological resources and it's only a matter of time before the "ecological debt" we're ringing up comes due. Source for above: Living Planet Report 2004. Published in October 2004 by WWF-World Wide Fund For Nature (formerly World Wildlife Fund), Gland, Switzerland. © 2004 WWF. All Rights Reserved. 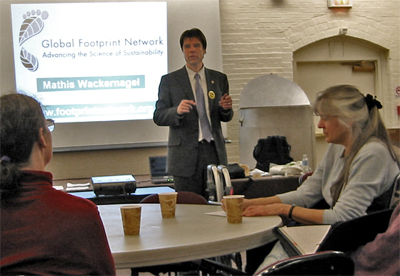 Dr. Wackernagel was in Connecticut last week to speak about The Ecological Footprint, an analytical tool he has developed to measure people's biological resource consumption. On Saturday, Network For A Sustainable New Haven hosted a workshop at the Yale Peabody Museum for local community groups aimed at exploring how New Haven's footprint or Connecticut's footprint might be calculated. According to Global Footprint Network, "Ecological Footprint measures how much land and water area a human population requires to produce the resources it consumes and to absorb its waste. 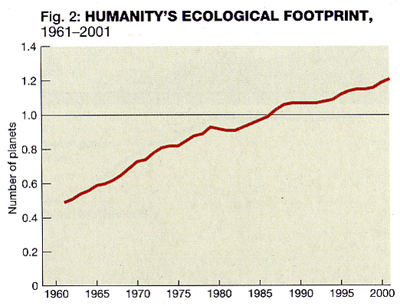 Today, humanity's Ecological Footprint is over 23% larger than what the planet can regenerate. We maintain this overshoot by liquidating the planet's ecological resources. Ecological Footprints enable people to take personal and collective actions in support of a world where humanity lives within the means of one planet." Ecological Footprint studies suggest that rates of human consumption, left unchecked, will exceed the ability of natural systems to replenish themselves. We'll soon reach a point of no return where a last fish will be caught and after that there will be no more. To live within our means, Global Footprint Network calculates that, on average, we need to live within a budget of about 2.2 global hectares or 4.4 global acres per person. "The question is, how can we all live well within this 4.4 acres," says Dr. Wackernagel (pictured above at the workshop sponsored by Network For A Sustainable New Haven), "and how much do we want to set aside for other species?" A 2002 footprint analysis found that the global human population has been living beyond its means since about 1985, and has since gone overbudget, requiring an average of 5.4 acres per person. People in the United States required 24 acres to satisfy their appetites for biological consumables and to then throw out their trash. Others living large were Canada (18.5), Australia (17.3), France (13.8) and Japan (10.6). Those not yet eating their full share of the pie included China (4.0), Egypt (3.5), Ethiopia (2.0), and India (1.7). The results leave open the possibility that there may come a time when the balance of power between nations of the world may revolve around disparities between ecological debtor nations and ecological lender nations, and a new economics based on dwindling biological resources could emerge. Yet, "ecological debt" isn't a factor in current economic analyses, or that most economists even measure or track. 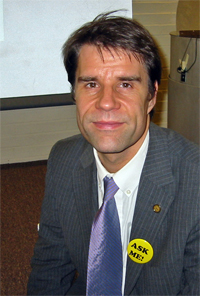 The question that Dr. Wackernagel has spent the past fifteen years laboring to fix has been "How can we operate economies without measuring ecological debt?" As things are, the best anyone can do is guess at what percentage of the world's Gross Domestic Product (GDP) needs to be invested in an effort to get us back on a budget for One Planet Living. "A rough guess is 5%," says Dr. Wackernagel. Global Footprint Network has undertaken its "'Ten In Ten Campaign' to make the Ecological Footprint as prominent as the GDP, and by 2015 to have ten countries managing their ecological wealth in the same way they manage their finances." So far, it has gained the involvement of the Swiss government and a statement of support from the European Union. More commitments from governments and individuals are needed. 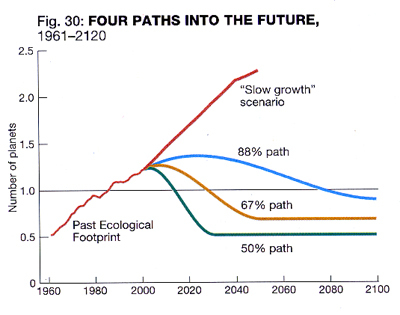 Even so-called "slow growth" plans have the world going deeper into ecological debt. Global Footprint Network projects that global consumption of biological resources would have to be cut in half to reach a balanced eco-budget of 4.4 acres, or 1960 levels, within the next twenty years. Even more than a financial investment, a balanced biological resource budget will require large-scale political and social change as well. As a first step, try calculating your own ecological footprint.